The Little Karoo is situated in the Western Cape, between the Swartberg and Langeberg Mountains, and offers a rich centre of diversity for succulent plants. The climate is semi-arid with rainfall in winter and summer. The rocks and soil used in the conservatory display include Enon Conglomerate and Witteberg quartz, which were obtained from local farms near Oudtshoorn and Laingsburg. The terrain of this area is hilly and rocky, with quartz gravel flats and hills in the western part. The vegetation is Succulent Karoo, which is included in the Cape Floristic Region. As the name implies, succulents dominate in this region especially the families Mesembryanthemaceae and Crassulaceae. Small shrubs that can be seen in the Little Karoo bed include Plumbago tristis (Karoo plumbago or Karoo syselbos), Senecio acutifolius (serpentine bush or serpentynbos) and Crassula arborescens ( jade plant or beestebal). 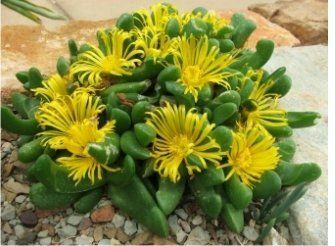 Senecio articulatus (worsies, which means little sausages) resembles a Euphorbia. It has attractive green mottled and jointed stems. Prominent members of the Mesemb Family (Mesembryanthemaceae) growing in this section include: Gibbaeum species, kown as haaibekkies in Afrikaans, which literally means little shark jaws, from the way the leaves resemble a gaping mouth; Glottiphyllum species, known as volstruisvygie or volstruiskos, meaning ostrich vygie or ostrich food, a genus of about 10 species mainly endemic to this region (see adjacent photo), with large soft green cylindric to flat very juicy leaves and conspicuous yellow flowers during winter and spring; Sceletium species, known as kougoed meaning chewing stuff, which have spreading stems with soft succulent leaves and white to yellowish flowers. In the past they were fermented and used as a sedative by the local people. 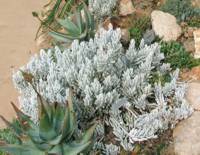 Senecio haworthii (woolly senecio) is a spreading succulent with beautiful silvery green tapering succulent leaves. It forms distinct clusters and its daisy flowers are yellow. In Afrikaans it is known as the tonteldoosbos, which means tinder-box bush. The matted felt of fine silver hairs, which strips off the leaves, was used in former times as tinder to light fires. The plants are easily grown from cuttings and thrive in cultivation. There are also many members of the Stonecrop Family (Crassulaceae) and the most conspicuous Tylecodon paniculatus (butter tree or botterboom). The plant has a thickset stem and with the appearance of a dwarf baobab tree. It has a yellow peeling bark exposing the green stems. It is deciduous during summer. The plant flowers during midsummer when its tubular red flowers appear. They are rich in nectar and pollinated by sunbirds. Aloe lineata (adjacent) is an erect growing aloe forming a shrub. Its leaves are striated. It flowers during winter and pollinated by sunbrids whom frequently enters the conservatory. Other aloes on display includes Aloe mitriformis subsp. comptonii, Aloe speciosa (tilt-head aloe) and Aloe microstigma. Euphorbia species, known as succulent spurges, are also well represented here. Euphorbia clandestina (volstruisnek, which literally means the neck of an ostrich) has a single, erect, warty and cylindric stem. Euphorbia susannae is a dwarf plant well camouflaged among the gravel background.